Japanese Schoolgirls? Zombies? Katanas? Chainsaws? I’m In, B. 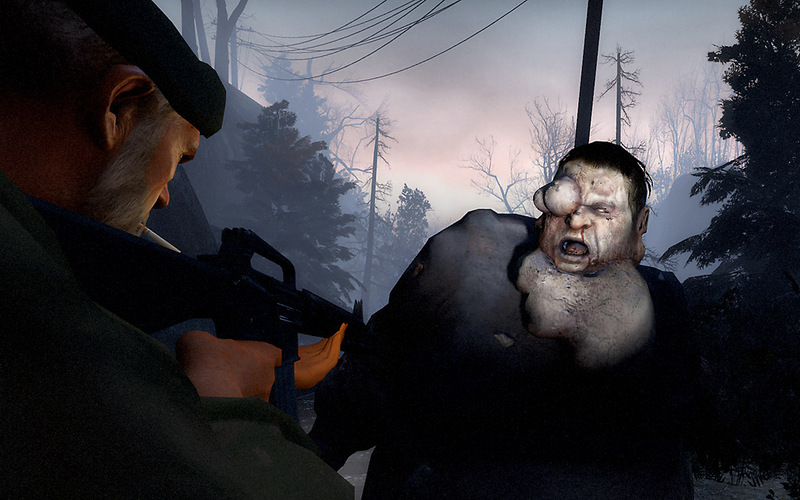 If you ask me, there’s only one way to deal with zombies: Rack ‘em up and knock ‘em down. I don’t care if they’re urban, rural, or suburban. You gotta show ‘em who’s boss, and you can’t be the least bit ambiguous about it, or soon enough, one’ll be sinking his nasty dental work into your neck. If you really wanna raise the stakes though, do what the new low-budget Japanese horror flick, Uniform Sabaigaru, above, which opened recently, does: Throw innocent teenage schoolgirls, right, into the mix. If you think co-eds can be brutal, wait’ll you hand one of ‘em a Black & Decker. What Today’s Well-Equipped Homeowner is Workin’ With. Now, that’s what I’m talkin’ ’bout. 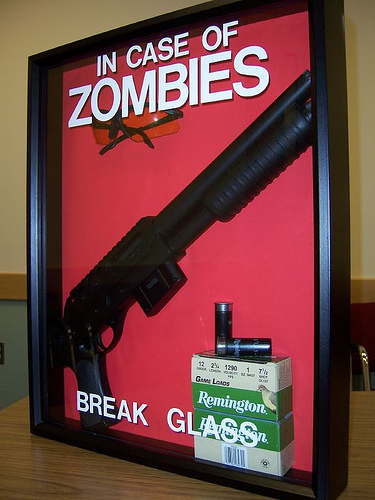 You’d think with all the increasing hubub about the coming zombie apocalypse, more folks would be getting geared for the dawn of the dead. Leave it to blogger Zack Danger to pick up the gore-soaked slack with his official Danger Zombie Survival Kit. The emergency wall case, above, comes done up with a blood red mat in a black frame under glass. Inside, it’s power-packed with a stockless tactical shotgun, two cartons of 12-gauge shells, and safety glasses, to protect your eyes from flying metal or bone fragments. Rollin’ up like that, zombies stand less of a chance than roaches swimming in Raid. 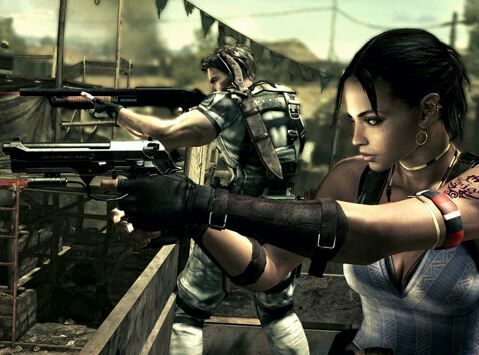 Like I said, after catching a glimpse of Left 4 Dead‘s corpse-ridden hell, lemme at ‘em. 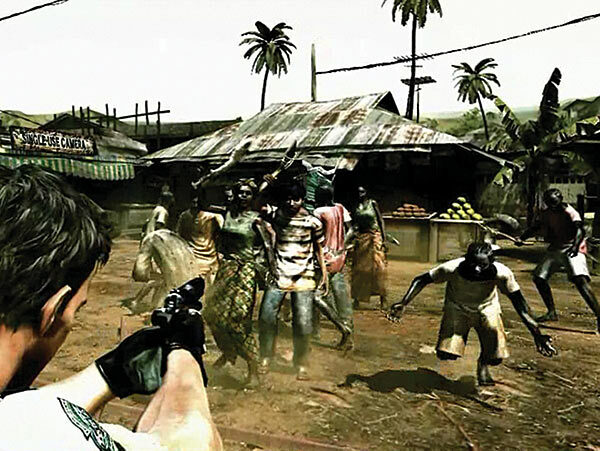 Long before its scheduled March 2009 release, Resident Evil 5 (RE5), the next installment in the immensely popular and influential survival-horror videogame series, started coughing up blood…and controversy: In the narrative, a white protagonist, Chris Redfield, sets down in what appears to be an African or Caribbean country decimated by a mutant “supervirus.” Suddenly, freshly dead villagers start to revive as bloodthirsty zombies, and Redfield must slaughter them in hordes to stay alive, a la this scene, below, from the game trailer.